Visiting Toba Lake in North Sumatra is endless. This time iweblogsite will provide the best experience for you, before visiting one of the largest lakes in Southeast Asia. Let's check these out! Bakkara is actually not a new name for me. The name of this place is so familiar. The location is in North Tapanuli, not so far from the parents' homeland in Dolok Sanggul. Bakara village is well-known as the village of one of the national heroes of the Batak land, namely Sisingamangaraja XII. Even though the name Bakara is so familiar, even since I was 5 years old I often vacation here, but I have never visited it. What is going on over there? I don't really know and are not very interested in finding out. Apparently, Bakkara is beautiful! Where have I been all this time? I regretted then while seeing the beauty of Lake Toba from a height precisely at Panatapan Bakkara, just before arriving at Bakara village. I only spent three nights in Dolok Sanggul visiting my grandmother after a vacation in Sibolga. Usually the family at the end of each year goes back to the village to celebrate Christmas and New Year. The second day in Dolok Sanggul, we planned to take a trip to the area around Dolok Sanggul. Initially I wanted to see Sipinsur, a Geo Park Site which was the mainstay of Humbang Hasundutan Regency. However, in the middle of the road we turned to Bakara just to see the village briefly. Staring at Bakkara Village and Lake Toba from Altitude. It turns out very beautiful, Bakkara is really beautiful. Our car went down to recite the road with a ravine beside it. As soon as I turn, I slowly see a view of the valley with the blue color of Lake Toba. Immediately I opened the glass and pointed my camera and asked to stop immediately. Along the Bakkara village. Okay, we go downstairs. Finally we went down the road to the Bakkara village. We must be careful because the road is quite narrow and on the side of the road there are quite deep gaps especially when meeting the car from the front. Perfect landscape. This is the village of Bakkara, as long as a hero from Tanah Batak, Sisingamangaraja XII. 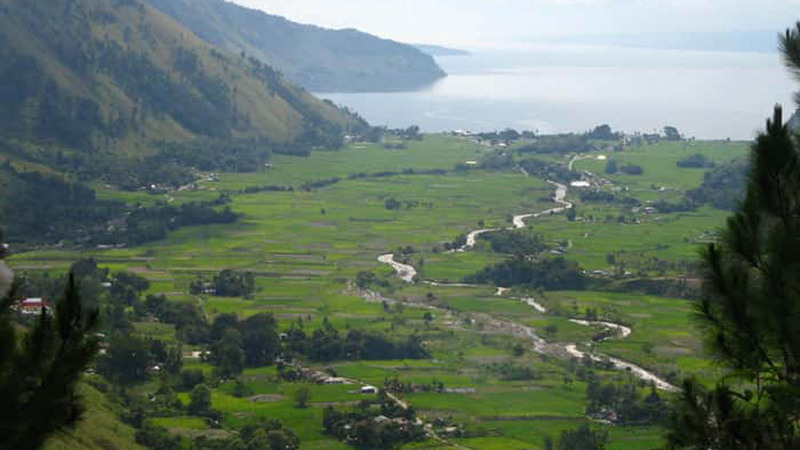 Located in a valley on the outskirts of Lake Toba. Almost all the way, I saw rice fields of the local community with cliff background. Huta Ginjang entered North Tapanuli district, becoming the final destination. For a day we traveled to two districts. In Indonesian, Huta means village, and Ginjang means upper, or village / village above (altitude). Huta Ginjang is indeed one of the attractions in North Tapanuli district. The view from a food stall is perfect to see the beauty of Lake Toba from a height. The air is cold and fast enough as if the reason for ordering a bowl of boiled noodles and warm sweet tea. Not far away, one of the spots used as a base for paragliding. How does it feel to see Lake Toba while paragliding? That's all about Visit Toba Lake, Bakkara and Huta Ginjang, Best Destination at North Sumatra, we hope you enjoy it. Don't forget to share this iweblogsite post on your social media. Thanks for visiting.